Essence Carson is relying on resiliency. Shoni Schimmel is passing the WNBA test so far. What have we learned from two games? The rookies are making an immediate impact. A minute with assistant coach Marianne Stanley. The league has their own “race to the MVP” rankings, based on three days worth of games. And there are up and down arrows, despite the fact that this is week (three days) one. The Final Four left a lasting legacy on the city of Nashville. UConn guard Brianna Banks is transferring. Purdue has extended coach Sharon Versyp’s contract through 2019-2020. Austin Peay declined to renew the contract of assistant coach Dean Walsh. Jacinta Vandenberg is transferring from Fresno State to Oregon. 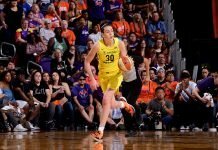 I find it so disrespectful to women's basketball when even wnba.com gets facts wrong. In the MVP race article, they have the Liberty as 0-2 (incorrectly stating that they lost to Connecticut). Did Tina Charles move down based on incorrect info…who knows? And honestly, with this kind of error in reporting…who cares… I almost don't even want to read their articles and listen to the game calls when they don't proof what they write and can't even pronounce prominent player's names correctly…smh!